Send us your pancake recipes! Post your favourite recipe for pancakes on the Forum. Spare a thought for the environment as eggs are cracked this week by recycling pancake leftovers. By wasting less food residents can save money and also save landfill sites being filled with unnecessary waste. By recycling more waste, residents are also increasing their chances of winning a cash boost for their ward in the Recycling Rewards scheme. 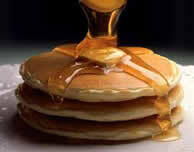 All food waste left over from Pancake Day can be recycled using the food waste bins including egg shells. Food waste makes up around a quarter of all rubbish thrown away in Ealing. Food waste should be placed in the food waste bin for collection outside residents’ homes. Just like the green box it is free and easy to use. Food waste bins will be collected on the same day as green box and refuse. Recycling Rewards sees people living in each of the borough’s 23 electoral wards competing against each other to win cash for their local area. The ward with the highest proportion of households recycling, as well as the three with the greatest improvement in recycling rates, will be awarded £20,000 each to spend on local improvements through their local ward forum. The final survey to decide the winners will take place this Spring, so now is the time to recycle as much as possible. The Love Food Hate Waste website can also offers more tips on how to reuse food, how to calculate the correct portions to reduce waste, and also has recipes, including some for pancakes.